I was surfing instead of working (reading quilting blogs is much more fun than my normal work) and found a blog by Kindred Crafters that talks about a string quilt top. Now the discovery of this blog post is very timely. I’ve been staring at my piles of scraps lately, wondering what to do with them. I have some great looking jelly rolls left over from a quilt I made for my daughter’s freshman dorm room. I think I know what to do with them now. 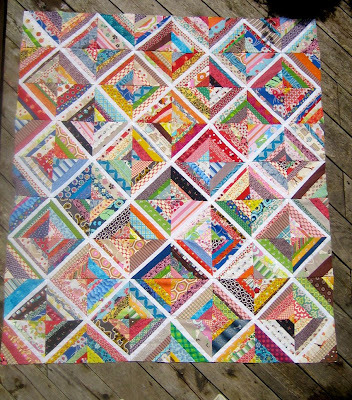 Even if I don’t make an entire quilt top, I could easily do a wall hanging and get some instant gratification. The Kindred Crafters’ blog references a tutorial on this technique by Ashley of Film in the Fridge (love that blog name…gotta see what that’s about). It looks like a good, simple technique that even a beginner can have success with. Going to dig out those leftover jelly rolls….. This entry was posted in Techniques and tagged scraps, string quilt. Bookmark the permalink.